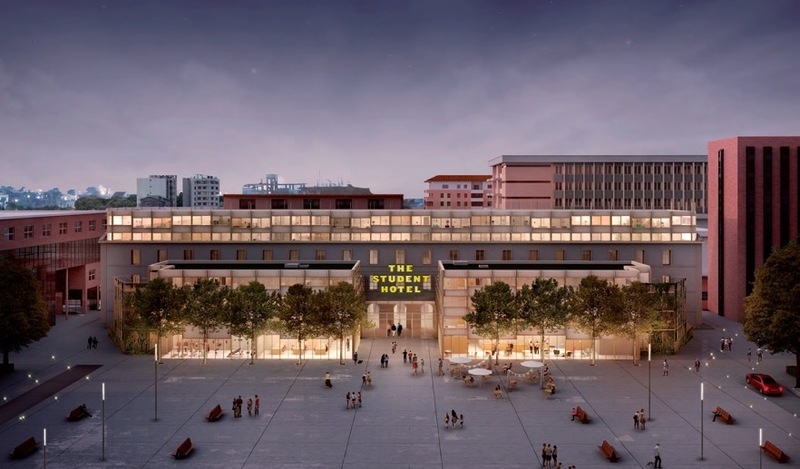 The Student Hotel group, pioneer of hybrid high-quality co-living, co-working hospitality and student accommodation, has chosen Toulouse for its new 354-room French location in partnership with Icade Promotion and Ynov Campus. The Student Hotel will open its first hotel and student co-living destination out of Paris region on 1 Rue Sebastopol, Toulouse. The hotel will face Place de l’Europe an iconic square of Toulouse, next to Toulouse Business School and a walking distance to Toulouse city center. Refurbishment by Icade Promotion of the 10,870 sq. m. Student Hotel will start early 2019 (Q1) and the opening is planned for spring 2021. The Student Hotel Toulouse will take over the historical Compans-Caffarelli barrack location originally developed in 1851. Two buildings will be built just in front of the existing location to bring the total floor area to 10,870 sq.m. The project will actively participate to the regeneration of the Place de l’Europe area by bringing an unprecedent offer to both locals and guests. The Student Hotel Toulouse will consist of contemporary hotel rooms and co-living studios for students, young professionals, international travellers and entrepreneurs. The wide ground floor has been designed to be open and inviting to the public and local community. It will include a wide variety of high-quality services such as study and gaming areas, meeting rooms, a restaurant and bar, and a gym. The Student Hotel experience is inspired by the existing Compans-Caffarelli barracks which existing external envelop will be mostly preserved. Combining the existing architecture with our brand of eclectic interior design, the intimate communal spaces will include a cafe/bar, grab&go eatery, working café, lounge and gym. The rooms are a retro chic design balancing original details with our modern amenities and furniture. The design will integrate a rooftop with a swimming pool to boost the vibrant experience of our guests and residents. On top of having one of the most successful rugby team of Europe, Toulouse is also famous for its unique architecture made of pinkish terracotta bricks that gave it the nickname of the “Pink City”. Seating on the banks of the River Garonne is the 4th largest metropole of France and the centre of European airspace industry. The city is also home of one of the oldest university, University of Toulouse, founded in 1229 and has a student population of more than 110,000 people out of which 15% are international students. The Student Hotel Toulouse is located within 10 minutes from, Toulouse Business School, University 1 Capitole and the historic city centre. Denis Montrelay, The Student Hotel’s Director of Investment says: “We are very excited to be able to open a TSH in Toulouse. The location in Toulouse fits perfectly with our ambition to regenerate fundamentals area and create a vibrant heart which will address the needs of both the locals and international community ensuring Toulouse is a key destination in our European network”. The acquisition is in line with The Student Hotel group’s strategy to develop high-quality, mixed-used accommodation in major European cities to meet the demand and new way of living and working of students, young professionals, international travellers and entrepreneurs. Following this acquisition in Toulouse, The Student Hotel group is now looking for other (re)development projects in French cities such as Paris, Bordeaux, Marseille, Lyon, Lille, Nantes and Montpellier to further build the French portfolio. Facilities High quality and contemporary design serviced student and hotel rooms; restaurants, bars, gym, communal areas open to the public. The Student Hotel co-living, co-working business model provides a unique hybrid destination for a fast-growing international community. The developer, investor and operator has 4,392 rooms in 10 hotel locations including: Rotterdam, Amsterdam (2 locations: City and West), The Hague, Groningen, Eindhoven, Maastricht, TSH Campus in Barcelona and as The Student Hotel Paris in France. The Student Hotel Florence, Bologna and Dresden will open in 2018, Madrid, Berlin and Delft open in 2019. Rome and Vienna open in 2020. Toulouse will open in 2021. The group plans to have 41 properties (17,550 rooms) in the major European cities by 2021.